then I'd never have any regrets in comparing my life with your counsel. What is it you compare your life to? Is it another individual? Perhaps it is a set of rules or standards you strive to adhere to. Or maybe it is an illusion of perfection you set up as a "desired outcome". Either way, you will be disappointed in comparing your "progress" in life to any of these! When we compare ourselves to others, we can do one of two things - either we get really humbled by their actions (making us feel guilty), or we feel like we showed them up (making us feel really proud). If we spend all our time trying to "live by the rules", we sometimes get so bogged down in the rules we miss the life that is happening all around us. Most of us have had some type of illusion of perfection in our minds at one time or another - it does not take much to burst our bubble on that one! David is very clear - the only thing worth "comparing" our life to is the Word of God (his counsel). When we have a reliable standard by which to "measure" something, we are not disappointed with the results. I began today with some pretty "unreliable" standards by which we can "measure" the course of our lives. We have a much more trustworthy standard in the wise counsel of our Creator! Who better to give us the directions by which to live than the one who did the creating in the first place? As we digest these verses a little, I'd like us to focus on the word "compare" for a few moments. When we understand what we are doing when we "compare", we might get a little insight into what it is that God has provided for us in his Word. - When we compare something, we are examining it side-by-side with something else. In other words, we examine it to see both the similarities or the differences between the two. David says that when we put our lives up alongside the counsel God offers (the Word of God), it points out some of the similarities and differences within our lives. That is a good thing! When we know where we are the same - we can rejoice. When we know where God needs to spend some time on those areas that stand out as "differences", we can take heart that his Word never returns to him without accomplishing what it set out to accomplish! - The process of making a comparison is usually for the purpose of finding the quality or value in the object being compared. For example, when we find a coin that dates back fifty or more years in age, we might go to the internet to find a coin collector's website. Then we input the information about our "old coin" in hopes that when we compare what we are holding in our hand to that which is displayed on the screen, we will discover that we have something of infinitely more worth (value) than just the "stated" value of the coin. That old "penny" suddenly takes on VALUE because of what the coin collector "reports" about the coin we hold. The same thing happens when we compare our lives with the Word of God - God declares the VALUE of what he beholds as worth much more than the "stated" value of our lives! David reminds us of the steps of a righteous man (or woman) - they are steady and they are progressive. I have said it before - it is not in the beginning that we realize our path - it is in the finishing! Value is sometimes not fully realized until a full examination is completed. That old coin is turned over and over - examining edges, wear on the images displayed, the "mint" markings, and the period in which it was produced. When we lay our lives out, making comparison of our walk with what the Word has to say about our progress, we soon find that there may be a little wear-and-tear on the "old coin", but the "mint" marking makes all the difference! We are "minted" by God! We hold the greatest "value" because of that "mint" marking! The "period" in which growth is produced in our lives is often a telling feature of the value of the path we have walked. Those "teachable moments" when God's Word was allowed to be the guiding force in our lives produce very specific "value". Just a important as the "minting" mark is the "period" in which a coin was produced. The coins of the greatest value are often those that were produced in times that were a little rocky! The same is true in our spiritual growth - the rocky times produce some of the greatest rewards! As you consider this passage today, ask God what "standards" you have been using to compare the similarities and differences in your life. If it has not been the reliable measure of his Word - it may be time to consider a different "source" of measurement! You're blessed when you stay on course, walking steadily on the road revealed by God. You're blessed when you follow his directions, doing your best to find him. That's right—you don't go off on your own; you walk straight along the road he set. You, God, prescribed the right way to live; now you expect us to live it. A few days ago, we looked at the meaning of the word "blessed". Many might have been surprised to know that "blessed" carried meaning such as consecrated, set apart, sanctified, and supremely favored. Words are rich in meaning - we just need to explore them to see what is "hidden" within. The psalmist sought to set out a series of "life-instructions" within the 119th Psalm. He begins with the lesson of learning to "walk". He will end with the idea of where learning to walk actually gets us! Today, we begin a venture into Psalm 119 - finding highlights from this rather long psalm by looking into the "words" behind the words. Oh, don't worry, I won't add to scripture! Just trying to "unpack" it a little for us. I often struggle with the concept of living a "sanctified" life. That is just a big word meaning "holy" or "set apart". When I think of a "holy" life, I think of one that is set apart from sin. So, now you probably understand why I struggle with the concept! Living "apart from sin" is more of a challenge than we realize when we first make the "leap of faith" by telling God we want to follow in his path! David realized that "staying the course" begins with taking the first step. You don't move forward in neutral! In fact, you don't move at all! So many times we wonder why we aren't making any progress in our "fight" over sin when we really just need to look at what "gear" we are in! We are in "neutral" - we haven't fully aligned ourselves with God's way of seeing and doing things, and we aren't too sure that we want to align ourselves with our old way of seeing and doing things any longer. - To go directly to the source. A straight course is a direct course. When we want answers - we should go directly to the source of all wisdom. When we hope to have our fear replaced with boldness - we need direct access to the all-powerful One. We often don't make forward progress because we are not on the direct course! - To move exactly parallel to the object of our attention. God expects us to walk on a "vertical" plane with him as the object of our attention. We often find ourselves walking on a "horizontal" plane - with all kinds of other sinners as the object of our attention. Then we wonder why we are not walking so straight! - To conduct oneself in an honest, upright, and honorable manner. Our Lord desires honesty - let me call it transparency. His desire in us being transparent is not so he can find out stuff about us that he doesn't already know - it is in us realizing what our real condition is! In the acknowledgement of our condition, we learn to lean on him. It is kind of silly, but we only walk "upright" when we are "leaning"! - To make progress that is continuous and unbroken. The hardest part of our walk is in the continual progress toward being holy. I take heart in knowing God has "declared" us holy already. In the steps between what we act like everyday and what he "declares" us as being, there are a whole lot of stops and starts. God's desire is that we learn to make continual progress - uninterrupted progress. God prescribes the path - we take the steps. Don't lose heart! We never walk alone - our path is exactly parallel to the object of our attention (and dare I say, our affection). Try walking an exactly parallel path to someone. Don't take your eyes off of that person. Try it! It is hard work! Why? Simply because we have to learn to trust the individual of our focus and not look down at the path at hand! That's hard! We want to focus on the path - God wants us to focus on him! So, as we begin to explore this Psalm over the next several weeks, let's begin with the change of heart that aligns ourselves in parallel movement with the object of our affection - Jesus. We can be honest with him that we'd rather be looking at the path! He knows that already! In learning to redirect our focus, we often do a better job avoiding the pitfalls along the way! Learning the lesson of walking "straight" begins with a change in our focus. 1-2Watch what God does, and then you do it, like children who learn proper behavior from their parents. Mostly what God does is love you. Keep company with him and learn a life of love. Observe how Christ loved us. His love was not cautious but extravagant. He didn't love in order to get something from us but to give everything of himself to us. Love like that. Have you ever heard the saying, "See one, do one, teach one"? In nursing school, that seemed to be the method they used to help us connect between what we were learning in the books and what we'd actually see, hear, smell, feel, etc., in caring for our patients. For example, we'd listen to lectures on the diseases of the heart. That lecture would be complete with signs and symptoms of irregular heartbeats, swelling in the extremities, and other "signs" that the heart may not be working as well as it should be. In our clinical setting, we'd be asked to take care of patients with "heart conditions" so that we could begin to see what we have learned, recognize how the symptoms manifest, etc. See one, do one - then teach one. The last part of the learning process was being able to interpret what we were observing, teach it back to our classmates, and then we'd finally have a full picture of what we'd learned. I think that kind of process is what Paul had in mind when he is telling us that we need to watch what God does and then do it. We often don't really take time to "see" what God does - because we aren't really paying attention to the example he sets for us. For some reason, we "like" the good stuff he does - like sending his Son to die for our sins, forgiving us without us having to jump through all kinds of hoops, etc. Yet...we miss the fact that we are to "learn" from what he has done, is doing, and will do in our lives! See one, do one, teach one! God uses the same method! We see his grace, we experience his grace, then we are expected to extend his grace! How do we learn - we keep company with the one doing the teaching. I think I learned more at the bedside with my instructors than I ever did in the classroom. Just observing how they spoke with the patients, how they handled the examination, what they listened for, where they poked/prodded, etc., gave me a better understanding than all that stuff in those shelves of books I poured through nightly. Oh, don't get me wrong - the book time was invaluable, but it was the actual "walking alongside" my instructor that helped me to "connect the dots". That is how it is with our Christian walk, too. The "book learning" (time in the Word on a consistent basis) is creating a set of understood precepts that will aid us in our walk. Those precepts help us make right choices (right assessments). In fact, without the right precepts to guide us, our assessment of what is in front of us may be quite wrong! Remember, we learn by also "seeing" the example in action. It is in the extension of God's grace that we come to appreciate the aspects of grace. The concepts of grace are taught in scripture. These are concepts like obtaining favor when our deeds would suggest something entirely unfavorable; being embraced in tender mercies when our attitude would suggest that we can do everything on our own; or being ever ready at our defense when our attentiveness to attack has become more like inattentiveness. The precepts God lays out in scripture are "foundation" to doing - living by the example we see, hear, and have experienced repeatedly. God's love was not cautious - it was extravagant and without measure. God's love was not selfish - it was extended even when we did not realize our need for it, regardless of how we acted toward it. God's love was no limited - it was before time, will be throughout time, and will be forever in time; there is no end to his love. With that type of example before us, Paul reminds us to take what we learn in the Word, begin to "model" those precepts/principles in the way we have seen it modeled by Jesus, and then become ambassadors of these precepts/principles to others. See one, do one, teach one. We imitate what we behold - are we "in the presence" of Jesus enough to have him as our primary example? We are guided by what we put into our minds - are we really getting into his Word and allowing it to get into us frequently enough to allow it to change our thinking? We learn by doing - are we applying what it is we are learning? It is in the application that the greatest learning begins to "cement" in our lives. Until I heard that first heart murmur myself, I really did not understand what it sounded like. Now, I can hear the faintest murmur with skill. How did I learn that? I studied the books to know WHERE to listen. I watched the experts to know HOW to listen. I practiced what I was taught until I understood WHAT it was I was listening for. It was a process - as is this thing we call our Christian faith. A process of seeing one, doing one, then teaching one. We don't stop at seeing and doing - it is in our imitating of Christ that we are teaching the next one to do the same. See Christ in action in your lives! Do what he has done - love extravagantly, extend grace without being asked, and be available to meet the needs of others. Teach Christ's love by your example. In doing so, you are fulfilling the role for which God has created you! See one, do one, teach one! 12-15 How blessed the man you train, God, the woman you instruct in your Word, providing a circle of quiet within the clamor of evil, while a jail is being built for the wicked. God will never walk away from his people, never desert his precious people. Rest assured that justice is on its way and every good heart put right. How blessed the man you train! How blessed the woman you instruct in your Word! Awesome words, huh? Did you know that there are other words for "blessed" in our English vocabulary? Namely, they are: Consecrated, Sacred, Holy, Sanctified, Supremely Favored, and Blissfully Happy! Wow! Now that says a lot, doesn't it? The one trained or instructed by God is really a pretty privileged individual! As I sat in English class during my high school days, one of my most favorite things I learned to do was "diagram" a sentence. My teacher would remind me that there is always a subject of the sentence, that a whole lot of other "matter" might be contained in that sentence, but it always has a subject! The subject of our passage today is GOD! Perhaps you missed that, so I thought I'd point it out to you! There is also a concept in constructing a sentence that is called "defining the condition". In other words, a cause-and-effect relationship is laid out. For example, "Bring me the remote, and I will change the channel." The condition is that the remote needs to be in my hand before the channel can be changed. The desired outcome of the cause-and-effect is that the channel gets to the one that we desire to watch. Here we have it - the condition - "Be trained by God" and "Let his Word instruct you". The outcome of the training and instructing - consecration, being made holy, growing in God's favor, and being blissfully content in his love! To that, I can only shout, "Woohoo!" Who does the training and instructing - this is the subject - GOD! - Those that are trained and instructed learn to enjoy the privilege of a "circle of quiet" in their lives! Have you ever wondered why some people call the time they take to speak with God, enjoy time in his Word, and to praise him their "Quiet Time"? Maybe the idea stems from this passage! When all the rest of the world is caught up in the chaos of the "clamor of evil", we can nuzzle up to Jesus and enjoy the "circle of quiet" that his presence provides! - God does not "walk away" from his people. In a world filled with all kinds of "deserters", that is a good thing to know! It does my heart good to realize that God actually pursues me when I am "walking away" from HIM! Not too many would pursue someone who is fickle enough to turn their back on the best thing going! Yet, in his intense love for us, he does! - Justice is on its way! We may not see it today, but there is a promised arrival! With its arrival - the good will enjoy the privilege of being "put right". What could that mean? I think God is reminding us that the picture may be bleak right now, but in the end, he is the one that makes his people shine! Just some thoughts for us to ponder today as we go about our busy schedules. Don't forget to draw into that "circle of quiet" and really let him do the work of training and instructing that comes in those moments. Those very moments may be what you will hold onto in the chaos of the hours ahead! Nicodemus came to Jesus under the cloak of darkness - maybe because he was a prominent religious leader of the day, afraid to be seen seeking answers from the very one that those religious leaders would ultimately send to the cross. As the story opens for us, we see a familiar scene of Old Testament times. The Rabbi (the teacher) would pose a question or introduce an idea that would stimulate thought and provoke conversation. Then, in the customary manner, the Rabbi would begin to "unpack" that question. Nicodemus acknowledges that Jesus is a great teacher and that he must have been sent by God because his "works" and his "teaching" display things that Jesus could only know and do if he were "backed up" by God. Jesus then begins the "dialogue" of the Rabbi - the teacher. Jesus lays out the idea or concept that he will "unpack" for Nicodemus: "You're absolutely right. Take it from me: Unless a person is born from above, it's not possible to see what I'm pointing to—to God's kingdom." Now, in the customary form of the Rabbi's, Nicodemus begins to "take apart" this statement, ""How can anyone be born who has already been born and grown up? You can't re-enter your mother's womb and be born again. What are you saying with this 'born-from-above' talk?" To that, Jesus adds our passage above - with the crux of the answer being in the statement: "But the person who takes shape within is formed by something you can't see and touch - the Spirit - and becomes a living spirit." Many would say that the Rabbis were great debaters - able to set up a topic for discussion, then skilfully bring it to a place of "dissection" until all the pieces of the topic were fully understood. Jesus is really using the "skill" of the Rabbi to bring the topic of what happens at the moment of "salvation" to light. To the unbelieving, this is some hard, and often ethereal mystery, too difficult to fully grasp. It needs "unpacking". To the one who is moved upon by the Spirit of God, it begins to be understood in small ways over time. We cannot see the Spirit in our lives - he is not something we can touch, get our hands around. In fact, we often don't know he is there, except when we sense his "prompting" or are energized by his "infilling". The person of the Holy Spirit has a unique purpose in our lives - our growth! It is the Spirit that bears witness with our spirit that Jesus is the Son of God (I John 5:5-7). It is the Spirit of God that transforms us into the image of Christ (2 Corinthians 3:18). He is at work - we don't see him - but we see "evidence" of his action. Jesus reminds Nicodemus that a mother does not "see" the work of conception or the development of what is inside her. She "knows" something is at work - that a baby is taking form. That which is formed within is a mystery until it is revealed. Today, we have 3-D Ultrasound, so the "mystery" of fetal development has really been unveiled in a whole different way than when Jesus was walking this earth. The woman "trusted" that what was being "created" within was something that would be awesome and a delight to receive. The same is true in our spiritual lives - the Spirit is at work bringing about what is awesome and a delight to receive. We don't "see" it now, but just wait! There are all kinds of mysteries at work in our lives through the power of the Holy Spirit who resides within. Those mysteries are being revealed in the right time, and in the right "framework". Two things that go hand-in-hand: God's timing and his framework. He has to "frame" us in a way that makes the growth he is bringing forth in our character a lasting thing - we call that laying the foundation. That is the work of the Holy Spirit - to lay the foundation. Then he has to produce the "evidence" of the work at the best "timing" in our lives. Not all growth is appreciated, but that which comes at the right "timing" is embraced in a welcoming way. Ever wonder why events are taking place the way they are? Perhaps it is the "framing" of our lives so that the appropriate "timing" can reveal what is taking form within! Don't know what God is at work in your life "forming" within - but I trust him to "frame" you well, bringing about that which gives evidence to the "forming" process that is at work within! Uh Oh! I think I forgot something! 6So seek God and live! You don't want to end up with nothing to show for your life but a pile of ashes, a house burned to the ground. For God will send just such a fire, and the firefighters will show up too late. Amos was one of the twelve minor prophets of Israel. He had a tough job - serving as the prophet during the reigns of Jeroboam II and Uzziah. The kingdoms were growing prosperous - some would say they were "feeling their oats". They had little time for God and lots of time for their good life. The armies of Assyria (one of their rivals) were battling for the territory of Damascus. In turn, Israel was allowed to live almost without battle and enjoy the expansion of their territory without the need for battle. Although the nation was prospering and expanding its lands, its heart for God was not so expansive. Values are often determined by the circumstances we find ourselves in. When Israel was "down on its luck" with armies battling them on every side, they sought God, listened to the prophets and wanted to be engaged in worship. When they seemed to be living carefree, they had little need for God in their lives. Their values were allowed to be shaped by the prosperity they enjoyed - oftentimes not adhering to the Law of Moses, focusing on their own gain, and leaving the poor or sick to fend for themselves. Amos comes with a tough message - either they wake up to their drifting away from God, or face his coming judgment! Now, don't get me wrong - his message was vital, but it was also a hard one to deliver. Probably even harder to listen to when you find yourself enjoying great times and realize you just might have left God out of the equation! Here's the cold, hard facts - God makes no differentiation when it comes to sin. Either you are guilty of sin or not. The fact that you are a child of God when you sin is just as significant as when the unbeliever sins. The only difference is that we recognize that we have someone to run to with our sin! Israel had been in this position of being a little to "comfortable" in their walk before. Here's what I want us to see - with each period of compromise, compromise gets easier and it gets bigger! There are times when our heart of worship is melting away - all the while we are oblivious to the compromises we are making that lead us to that point. Thank goodness that God gives us messengers of his grace! We may not get a "prophet" to show up on our doorstep, but we do experience the grace of his message! It may be in hearing the Word of Truth through another believer, or a convicting thought comes to mind through the action of the Holy Spirit within, but we get the message! Here's the truth of what Amos tells Israel - your position as God's chosen does not make you exempt from his position on sin! We have a responsibility to live right! When we don't - God reminds us of our responsibility! Plain and simple. Some of you may have wondered why I call my blog "The Plumbline". It is actually from this prophet's writing. In the 7th chapter, verses 7-9, God gives Amos a vision. It is of a plumbline hanging from the hand of God. God asks Amos what he sees and he answers that it is a plumbline. God's word to Amos is that he is "measuring" the "plumb" of Israel's heart based on their actions. That is what God's Word does in our lives - it measures us to make sure we stay on the "plumb" with God. When we are getting a little "out of plumb", his Word has a way of bringing us back into plumb. That is why God sent the prophets of the Old Testament - to act as a plumbline to bring Israel "back to plumb" with him. Many of us "gloss over" the Old Testament writings saying that they don't really make a lot of sense and seem to be only spoken to Israel. The fact is, God reminds us through their example. We cannot think ourselves above their actions. We "drift" away from God in our contentment just as easily as they did! So, I think as this year begins to draw to a close and we begin to consider the gift of Christmas that we celebrate in just a month, it may be time to begin to consider the condition of our hearts. We might find that we are "melting away" without really seeing that we are. Before we find nothing but a pile of ashes to remind us of what we once enjoyed, wouldn't it be better to "adjust our plumb" now? This season of remembrance can be made all the richer by us drawing close to our Savior, remembering his graces in our lives, and reaching for him afresh with our whole heart. Be plumb! 12-13 Even though a person sins and gets by with it hundreds of times throughout a long life, I'm still convinced that the good life is reserved for the person who fears God, who lives reverently in his presence, and that the evil person will not experience a "good" life. No matter how many days he lives, they'll all be as flat and colorless as a shadow—because he doesn't fear God. The Good Life - how many times have we said it or heard it said by another - "Aah...this is the GOOD life!" We are kicking back on the beach, enjoying the rays, listening to the palms fronds rattling in the wind, and then we utter these words of absolute contentment! The next thing you know, a gust of wind blows away your umbrella, a happy-go-lucky child throws sand on you, and the sun drifts behind the clouds! What happened to your "contentment" in that moment? Ummm....honestly....it was no longer the "good life"! Our passage today deals quite honestly with our impression of what a "good life" really is. We get our focus a little misdirected at times - giving us a warped perception of reality. You see, the wind was always there, the clouds were passing over as we uttered those words of contentment, and the child had been working on that sand castle for hours! We just failed to see what was right before our eyes! Those who have followed my posts for a while know that I often bring us back to our "perceptions" of things - because perception often determines reality in our minds! Look at the verses again. The passage sets out a lifestyle of sin against a lifestyle of reverence for God. The "good life" is really based on something entirely differently than we often imagine. In fact, rarely do I hear anyone describe the good life as serving God first, being less focused on self, and being an obedient steward of the grace God has given in their life! Yet, it is not what we "get by with" in life that makes life great - it is in the fact that we get "nearer" to God that makes it truly great! In fact, a life without God is "colorless as a shadow" and "flat"! I thought about that a little - it takes the sun to cast a shadow! The more "face-on" you to the sun, the longer your shadow. Let me make this clear - the more face-on you to the Son of God (Jesus), the longer the shadow! In other words, you reflect his greatness in your life! It takes the light to realize the "color" in our world. In the darkness, color is really meaningless. You can be standing smack-dab in the middle of a room filled with vividly paint walls, richly upholstered furnishings in dynamic colors of the rainbow, but without the light in the room, those colors mean nothing! It takes the "light of Life" (Christ) to fill our days with color. There is another side to this passage that I just cannot glance over as it brings conviction to my heart as I read it. The idea is that we may "think" we get by with stuff (not always good stuff either), perhaps hundred of times, but nothing escapes God's view. That means that even though we don't "get caught" in our sin, he knows it is still there. There is nothing we can hide from him. Want color and light in your life - get honest with God and then enjoy the Son-shine! 2 "Walk straight, act right, tell the truth. 3-4 Don't hurt your friend, don't blame your neighbor; despise the despicable. never take a bribe. You'll never get blacklisted if you live like this." David was a man after God's own heart. I often consider what this really means. It seems that my "heart" can often betray me - so I am reluctant to "follow it" sometimes! In all the practicality of day-to-day life, David takes a little time to listen to what God tells him. He asks God a question, then he actually stops long enough to listen for God's answer. I think that is what it is like to have a heart after God - not that we always make the right choices and live 100% perfectly, but that we give God the central place in our lives. When David stopped long enough to listen for God's reply, he heard some very practical answers to his question. His question was simple: "Hey, God, how can a man be assured that he has a place in heaven?" I think we may have asked that question a time or two ourselves. He wants to get it straight in his mind. That is the way most of us like to live - get the facts and then we know what it is that we are expected to do. I have had an opportunity lately to lay out what my expectations for another individual are - in turn, that individual will lay out the expectations that are in their mind for me. This gives us an understanding upon which to operate in our relationship. - Walk straight, act right, tell the truth. Easier said than done, right? Walk straight means that we set our eyes on the goal and we don't take our eyes off that goal. I watched a cute movie the other day in which the three women were overweight, so they each had a "goal" that they kept in mind to motivate them to remain faithful to their diet and exercise plan. For one, it was a bikini. Now, that would not be my goal, but it worked for her! Every time she thought about "veering off-course" in her plan, she pulled out the bikini and remembered why she was on the course in the first place. That's how it is in our daily walk - sometimes we need reminders about where it is we are headed and then we just need to refocus a little. Action is an outcome of focus. Where we direct our attention, we direction our affection! When we are honest with ourselves first, we find it easier to be honest with God and others! - Don't hurt your friend, don't blame your neighbor; despise the despicable. Okay, we probably find it easier to be motivated to not hurt a friend than we are to do most things. Yet, in reality, we sometimes do hurt those we love the most. When we do, we have an obligation to make things right. I am learning to live "current" in relationships - not toting a whole lot of "baggage" from past mistakes and missteps in relationships around with me. Deal with it, get forgiveness, then work through the restoration. That is how God planned for us to live! Blame is so easy to assign when things are just not going well in relationship. Have you ever said, "Well if he/she had not said/done that, then I wouldn't have responded this way?" If you have, you are probably playing the blame game. It is always easier to shift the blame than to assume it ourselves! - Keep your word even when it costs you, make an honest living, never take a bribe. It sometimes costs us dearly to keep our word. Especially when we have made a promise without really considering the cost! I think that is why scripture warns us to not make a vow indiscriminately. We can regret our vows when we do. Living well involves us working well - applying ourselves, getting the job done, and doing it on the up-and-up. We cannot always be motivated for the "what's in it for me" mentality. We need to move beyond that to really doing things because it is the "right thing" to do! So, when we actually stop long enough to listen, these may be the kind of answers we get from God. The invitation today is to take time to really listen for the answers to your questions. God delights in giving us direction - we have to be just as delighted in waiting upon him for that direction! I have a friend that will come by the office periodically, notepad in hand, with the announcement, "You are on my list today!" I humorously reply that I hope it is her "nice" list and not her blacklist! I think that is how we often approach God's invitation to sit at his feet - we wonder if we are on his blacklist! Just know that God's grace is sufficient to always keep us on his "nice list"! 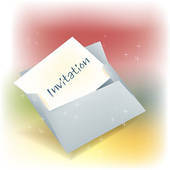 Heed his invitation today - you might be surprised at the answers you receive! I think that many of us do a great job at STARTING stuff - our hobby cabinets, bookshelves, and garages give testament to that fact. Yet, I wonder how many of us really FINISH what it is we start! I have a very creative daughter. In school, she would take all kinds of arts classes. I always enjoyed seeing what it was she created. She'd take on new projects with all the flare of creativity she could muster up, then when the project was taking too long, or something else caught her interest...it would be put aside unfinished. Another side of this story is my tendency to read as many as five books at one time. I will start them, put them down and take up a new one. When the mood hits me for a little of the mystery, I pick it back up, then it gets put down for the humor of the comedy, and so on. It should not surprise you that we are very "moody" people. We are driven by our emotions. If we "feel" it, we pursue it. If we don't, we just let it pass on by. Why? I think it is because we have some desire to feel "good" about what it is we are doing. I remember watching the Apollo missions while I was in grade school. The TV would be rolled into the classroom and we'd sit mesmerized watching as the lift-off would happen, then oooh and aaah when the separation of rockets would occur. I was certain that those men felt "good" about their mission in life. During that time in my life most of you would say I was a "loner". I spent almost all of my free time alone - a lot of it just exploring, considering "stuff", and playing the good old fashioned way we did back then. I didn't read a lot then - just hung out in the great outdoors of Arizona and did "stuff". I recall being inspired by those Apollo missions, working for days on a toothpick and Popsicle stick version of the Apollo spacecraft. I not only ate Popsicles in order to "supply" my building materials, but I went to where the ice cream truck stopped and collected all the discarded ones left behind by others that enjoyed hanging out under a tree eating their latest purchases. This creative project took some time - after all, we did not have super-glue or hot-glue guns in those days! It was good old Elmer's Glue for me! I really don't know how many boxes of toothpicks went into that three foot tall creation, but there were a lot! Then that "idea" resulted in building a house from those same materials, and then another, until I had a small settlement in the backyard. I was finally finished when all the pop bottle refunds I could muster up were all spent on the boxes of toothpicks and glue that went into the projects! We all learn the most from that which we actually see through to the end in life. Those "false starts" we may make at this little project and that new venture are simply that - false! Whenever our emotions are allowed to rule how we feel (and therefore, what it is we engage in), there is opportunity for many a "false start". Solomon tells us that "beginnings" are easy - it is the "finishing" that is hard. We "begin" with a flourish - how many of us actually "end" with as great a flourish? It is in the beginning that we seem to put all of our attention. If you don't believe me, think about what happens each January. People think about "getting healthier" and then they make all kinds of plans. They join the gym, buy workout clothing, and purchase the latest running shoes to give them the "edge". By January 15th, most of this stuff is in the back of the closet and the gym membership is discarded! The ending is where we should focus - the beginning is less important than the ending. We sometimes don't "end well" because we had a misconception about what the "project" we call life will entail. The fact is, the "building" of the good stuff in our lives is often a tedious process (just like toothpicks and Elmer's Glue made for slow work in building a spacecraft!). It is in the "sticking to it" that we find the results we really desire. I don't know what God has been speaking to you about, but if he is asking you to "begin", just know that he will help you "finish"! We don't have to "feel like it" all along the way - but when we finally "push past" our emotions, we often get the wind in our sails to see it through to completion! Want high returns on your investment? Be generous: Invest in acts of charity. Charity yields high returns. Don't hoard your goods; spread them around. Be a blessing to others. In the United States, this is the week of Thanksgiving. We will gather around tables across our nation with friends and family this Thursday to celebrate the season of harvest that our forefathers began so many years ago in Plymouth. The celebration of harvest was something to relish, as the hard work of the year was drawing to a close, and the land would soon lay at rest for while prior to the planting of the next crops. We've lost that sense of celebrating harvest over the years as our country has become far more of a manufacturing country and a lot less of an agricultural country. Yet, we continue the celebration without any real connection to its original meaning. In many ways, Thanksgiving marks the beginning of the season we call our "holiday" season. Between Thanksgiving and Christmas, families begin to prepare for Christmas by hanging lights, erecting decorated trees, and bringing out the nativity scene. The stores begin to fill with all kinds of reminders that this is a season of "giving" - urging us to purchase, purchase, purchase. The wee ones clamor for a place in line to sit on the lap of a jolly Santa figure who will listen to their pleas for a certain toy or a new bike. In fact, over the last 20 years or so, we have seen the trend to celebrate what can only be known as the season of "HalloThanksMas". It is the season where Halloween candy is just barely out the door, Thanksgiving decor is ushered in, and Christmas ornaments are not far behind! I heard an interesting statistic just before Halloween that made me ponder for a while. The reporter shared that in today's economy (and for many years now), the holiday where the most money is spent per member of the household is Christmas. But....the second most celebrated (and costly) "holiday" is Halloween! Does that surprise you? Well, the statistic showed that the average household spends around $250 per person to celebrate Halloween! Than included costumes, candy, decorations, and the parties. Ummm...I don't know about you, but I think that is crazy! I cannot remember the statistic for Christmas, but I was totally amazed at the amount spent on celebrating Halloween, a celebration with "roots" in celebrating the dead! Somewhere in the mix of things, Thanksgiving took a backseat as the "beginning" of the holiday "season"! I think we might want to reconsider our focus on this holiday! You see, I believe that in opening our heart to the spirit of being grateful, we are opening our heart to share with others. When we see how tremendously we have been blessed, we cannot help but want to share our blessing with others. I don't know how God is challenging you to be a blessing to someone this holiday season, but if you reflect long enough on how his grace has changed your life, what his love continually provides, and the keeping power of his protection over your life, you will begin this holiday season well! There are many who need nothing more than your love - evidenced in your investment of time in their lives. There are others who need your hands - bringing them skilled help where they can no longer do the work themselves. Then there are those that need our resources - filling their hungry bellies with nourishing meals. Whatever God moves you toward - do it! Don't be stingy in your THANKS - be generous in your GIVING! Have a blessed beginning to your holiday season! 1 If you love learning, you love the discipline that goes with it— how shortsighted to refuse correction! If you've read even one of my blog posts, you will know that I love to learn new meaning of words, explore how things work, and to simply understand the "why" behind things. I have a mind that works almost all the time - finding myself awaking in the night hours with ideas for the next blog, "fixes" to something that is needing my attention at work or at home, etc. I have had friends ask, "Don't you every just 'shut-off' and chill?" I guess that I'd have to say that I do, but it is just like taking a dimmer switch and turning down the "intensity" a little! The light just never is completely shut off! The passage today deals with a "test" - kind of like a little litmus test - to be able to tell if we really love being a disciple of Christ. The first part of this verse is the "set up", or the condition we look to have answered by the end of the verse. In other words, the writer 'sets up' the question: Do you love learning? Then gives us the 'evidence' that we do: Then you love the discipline and correction that goes with it! So, the 'litmus test' confirms our commitment to being a disciple of Christ by the attitude we take toward correction. Uh oh! Now I have gone to meddling a little! Yep, just like Jesus goes to "meddling a little" in our minds and hearts! The simple truth is quite evident - Jesus wants us to equate his discipline (correction) with his love. Before I go any further, let me just say that many have a negative perception of "discipline". This may be as a result of some authority figure using very negative and hurtful means to "discipline" in our past. If that is the case, let me assure you that God's discipline is not like that. In fact, his discipline embraces us - it never drives us away. His discipline guides us - it does not make unrealistic demands of us. His discipline is meant for correction - not to diminish us or release his anger in outbursts of emotion. The discipline of discipleship begins with a change of mindset and heart-set. As we begin to step out in obedient trust that God intends for "good" to be the outcome of our steps, we begin to encounter things in our past that affect the way we think and act in our present. We call this "awareness". We begin to sense that the "old way" of responding, the "practiced" way of responding, to things that life sends our way may not always be the desired way to handle them. For example, the tendency to get caught up in office gossip is an alluring part of our past. As we begin to grow in Christ, that tendency to gossip brings with it a little "twinge" of guilt (a feeling that something is not quite right). The more we spend time with Jesus, the more we become aware that this "habit" of our past is not to be the "pattern" of our present. Our mind is being challenged to think differently and our heart is being softened by the presence of the Spirit of God within us. As this occurs, we begin to associate the "twinges of guilt" with loving urges to not engage in those things that God declares to be sinful, unwise for our lives, or simply just not wholesome. As our love for Jesus' best in our lives grows, so does our desire to respond to his corrective leading. If you really want to "test" if you are growing in Christ, you simply have to look at how you are responding to his correction! Cry Wolf One Too Many Times? What rope are you hanging by?